A 3D zebra crossing has been rolled out in the Icelandic town of Ísafjörður in the hope that the optical illusion will impel drivers to slow down. The creative road markings were installed after Icelandic environmental commissioner Ralf Trylla was inspired by a similar project in New Delhi, India aimed at tackling speeding. 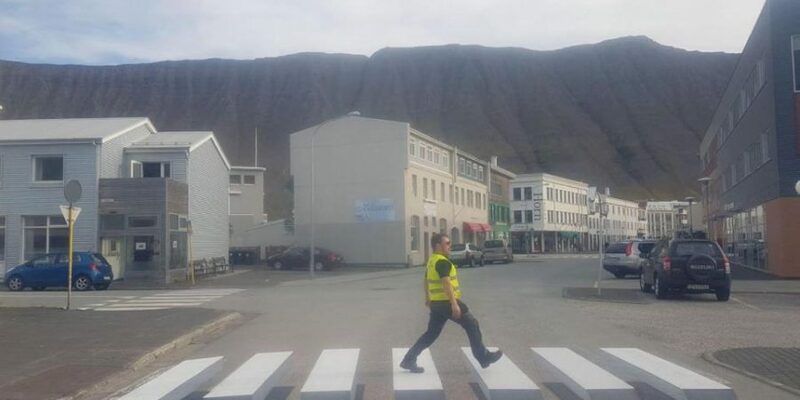 Trylla enlisted local Icelandic contractor Vegmálun GÍH who redesigned the crossing to create the appearance of stripes jumping out of the road. This roadway makes it look like a roadmap,” Gautur Ívar Halldórsson, managing director of Vegvísindun GÍH, told Visir. The project, which was supported by the Icelandic transport authority, was filmed in situ by Gusti Productions, showing the painted stripes transform into apparent 3D blocks as cars drive by and children cycle over the crossing. According to the Icelandic transport authority, similar three-dimensional pedestrian crossings have been introduced in Germany, Belgium, Austria, the UK, and Spain, following in the footsteps of the Indian road safety project. Last year, the Indian government rolled out 3D paintings as speed breakers in an effort to improve road safety. At the start of 2017 the New Delhi Municipal Council outlined their plans to extend the 3D project, citing its success so far.